COMPASSIONATE CLIMATE ACTION: 33 Days - "Ignorance Never Settles a Question"
"Ignorance never settles a question." I guess it struck me because I still sometimes sneak a peek at readers' comments online (I kind of vowed I would never do it again, but at least I no longer dwell) — and I am always amazed at the ignorance among those who would have us do nothing about the threat of global climate disruption. Nowadays, the word "ignorance" brings to mind unawareness, unfamiliarity, unconsciousness, inexperience, cluelessness, lack of knowledge, unenlightenment, illiteracy, lack of intelligence, foolishness (big words, all!). All of these terms seem to fit the deniers and skeptics and just plain ignorant people who make stupid comments on blogs and websites. But "ignorance" is a Middle English word that comes to us via Old French from the Latin ignorantia, from ignorare, meaning "not know, ignore," and seems to imply a deliberateness to that not knowing or ignoring, which I observe in these people — a refusal to look beyond their own understanding of the problem, as though there is nothing more to learn than what they already know. However, just how did anyone get a "strongly held worldview" that global climate change doesn't exist? It's not like it's been around in the public sphere for very long. And very few actual scientists are deniers and skeptics, so those deniers who are scientifically literate appear to be paid, egotistical or outside their area of expertise (and sometimes all three). 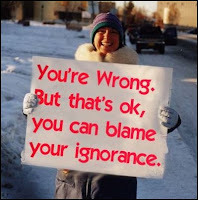 The rest of the climate deniers and skeptics must, therefore, be ignorant people. Perhaps they've read one article and drawn their own (dangerous) conclusion from that. Or they've listened to one too many drunks spouting off at the pub. Alas, "ignorance never settles a question," so this question won't be settled any time soon (there's a lot I still don't know about deniers and skeptics and I don't want to pretend I'm an expert, like, ahem, some deniers and skeptics do). But I wonder, could the ignoramuses please start doing some research synthesis of their own, before spewing their opinions about a scientific, humanitarian and highly visible phenomenon? They could read the original research reports, several of them, learn the science of climate change, and then have an opinion. But not a moment sooner, please. It turns out that a little knowledge is a dangerous thing. Ignorance is bliss especially when we can chose what to be ignorant about. I think you're onto something, Remi. It does seem as though the comments are almost "too" stupid, too ignorant to come from real people. It's as if there are people paid to trawl the web, looking for places to inject their "lines." I sure hope these people don't do it as a hobby! That would be beyond scorn. (Not that doing it for money makes it any less sinful.) Thanks for writing.